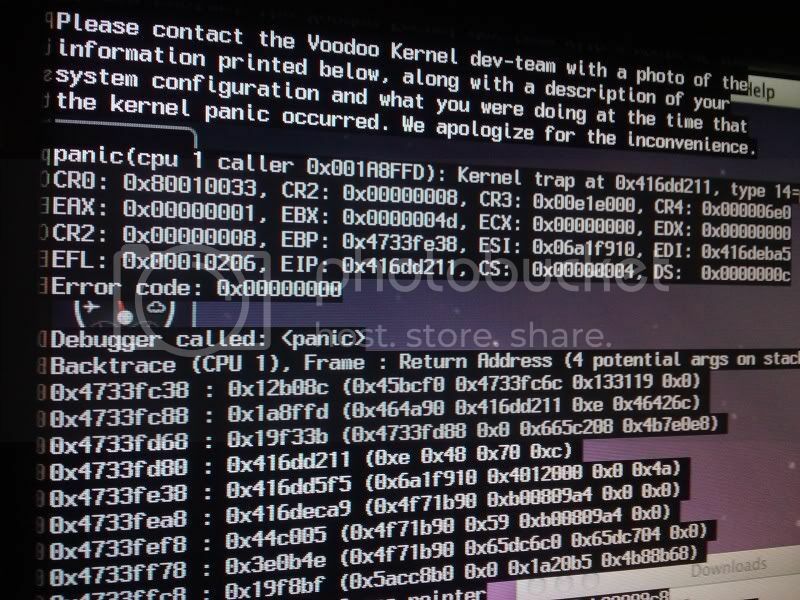 First I want to start off by saying I'm a n00b at Mac OSX86 and all stuff pertaining to it, 2nd I'm not even sure if I'm posting this in the right board but I was told to contact Voodoo after the kernal panic and this is the closest I found to contacting them, if I am posting in the wrong board by all means tell me and direct me to the proper board. There isn't much to say, my PS2 drivers werent working but I think my kernal panic was from something else, I was on the internet downloading something and it happened, below is a picture of the screen I got, I have other shots of it if you guys need different angles. Let me know if this isn't in the right forum so I can move it guys, I'm really itching to get back onto OSX haha. IIRC type 14 is page fault, so something is reading or writing to protected memory location.